Life Is What Happens: Let Chaos Reign!!!! On Nov 18, 1883 Sir Sanford Fleming spoiled all the fun - he got North America to adopt Standard Time. As a result we now have boring predictability. Why, because apparently before standard time each railway company (think airports, railways stations, bus and subway platforms today) literally had it's own clock. One station could have 5 or 6 clocks all set to their own time or the schedule established by their particular railroad - confusion reigned. Can you imagine Air Canada, Westjet, Porter and all the other airlines that fly into airports, with their own standardized time. So 3:00 for Air Canada would be, maybe, 2:30 for Porter and let's say 7:00 for Westjet. Talk about missed connections - throw into the mix a snowstorm and you have total chaos. I know we often have chaos when flights are grounded, but at least their times are synchronized! I don't know; something inside of me says that, yes it makes life easier to have everyone on the same page; but, something is lost - a happenstance, a serendipity, an accident in time that might make all the difference. 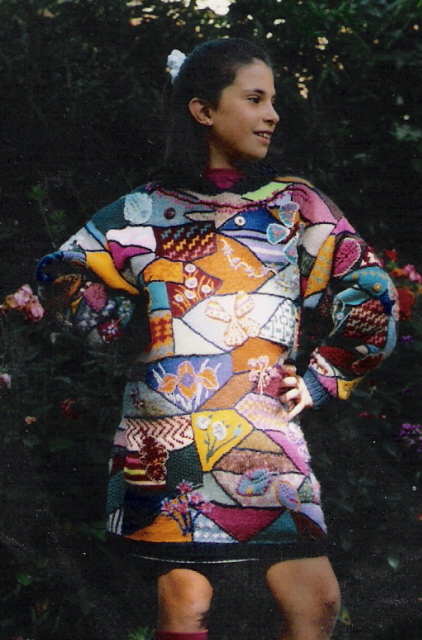 I designed Crazy Quilt Tunic and enjoyed the chaos so much that I went on to do Crazy Quilt Mitts and Socks. I have difficulty with directions. The Murphy's law that says, "when all else fails, read the instructions," speaks to me. Cart before the horse and all that. One of my goals in life has been to try to understand the theory of chaos - which I believe sets out to make chaos predictable - these scientists! Actually I have had knitters tell me that they have knit Crazy Quilt Mitts and have written down everything that they have done in the first mitt, so that they could make a second mitt exactly the same. There is something in us that strives for order! 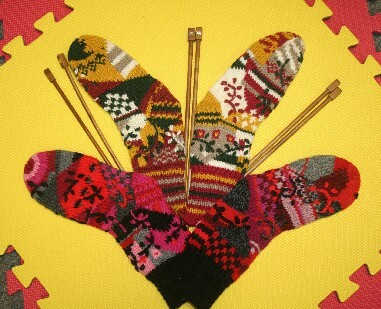 The whole idea of the chaotic crazy quilt is that you don't have to be bored with doing the same mitten twice! 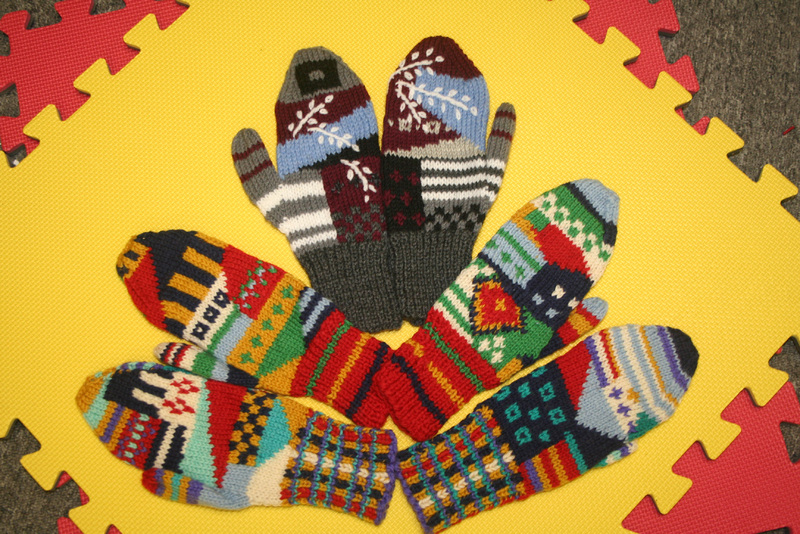 I also designed the Kitten, Puppy dog and Teddy Bear Mittens and a few others so that you could just knit one of any type of mitten and combine them together. Or if one mitten of a set were lost, you didn't have to throw it away - you just wore a dog with a cat or a teddy bear with a pig etc. Kids would understand. Now, I do believe in manners and standardized etiquette; but when it comes to artistic expression, be creative! That's why the more we standardize in our environment, the more we think that things should be standardized and the more we lose in creative expression! Dinner tonight - something unpredictable. Soup usually works. To a can of broth add whatever works from the fridge or cupboard. Or a stir fried rice something - to a couple of cups of cooked rice in a frying pan add whatever works from the fridge or cupboard. I promise to be more controlled tomorrow. I think that I have been doing too much lace, which really requires discipline, so I had to vent! Let's Hear It For Herm!! What toque you so long?